In Reflections, accomplished Oakland painter James Gayles draws poetic responses to his best watercolor works and looks back at his career. 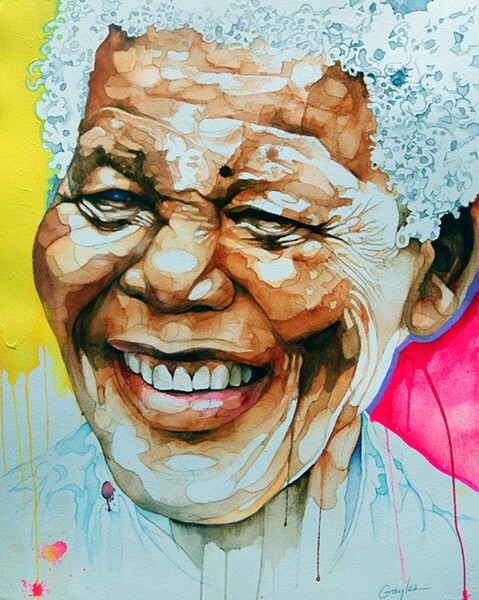 Gayles' topographical portrait of Nelson Mandela. James Gayles has a lot to look back on. Growing up, his parents owned a thick Bible illustrated by the works of renaissance masters. He spent his youth carefully copying each painting, teaching himself portraiture by emulating the way each religious icon was rendered. After high school, he found himself studying painting at Pratt Institute. Later, he went on to receive an Emmy for his illustration work as part of the NBC News graphics team. At that point, Gayles had cultivated a distinct style: watercolor portraits that illuminate the life of the subject by translating their face as a topographical map of light and shadows, harnessing their character with dynamic, bleeding pools of color. If a Chuck Close painting — rendered as a systematic grid — is an aesthetic orchestra performing a portrait, then Gayles' work is a band of jazz masters riffing off the classical regiment of representation. The artists are similar in their mosaic methods, yet Gayles is much more fluid, organic, and free in his expression. Eventually, he decided to take this style with him to the Bay Area. Straying from his commercial work to focus on fine art, he returned to creating portraits of icons, but instead of Biblical sources, he turned to black history. 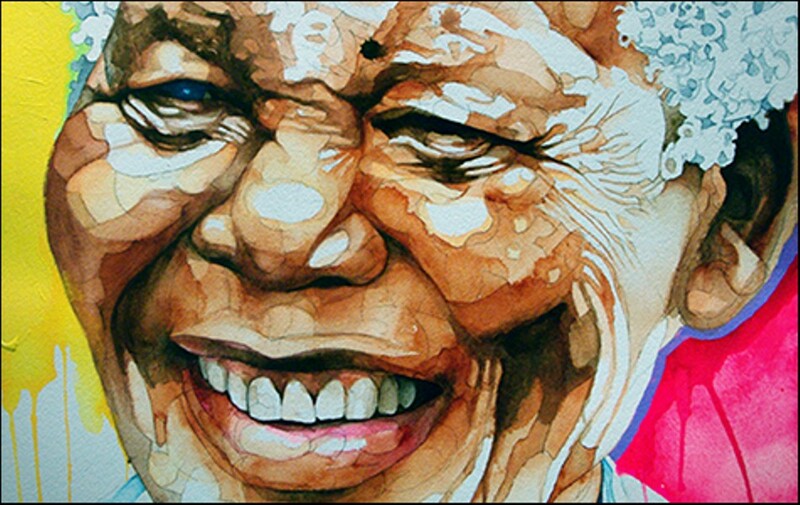 In 2006, he received a grant from the City of Oakland to paint a series of blues masters. A few years later, he received another grant to do the jazz masters, and in another few years he added the Latin jazz masters to his portfolio as well. For his current show at Oakstop (1721 Broadway, Oakland), Reflections: A Collaboration Between Painting and Literature, Gayles gathered his best works throughout the years and asked local and international writers, such as Marvin X and Tureeda Mikell, to create literary responses to the pieces. In the gallery, the faces of Miles Davis, Nina Simone, James Baldwin, and Nelson Mandela hang next to their literary interpretations. The words provide the works with new dimensions, involving them with a literary process of artistic play, this time riffing off the conventions of language. Perhaps the title of the show is both a reference to its retrospective character, and an allusion to the relationship between illustrations and the text that accompanies them — the interplay of word and image that churns out cultural mythology. Gayles said he was interested in exploring the potential for collaboration within that interplay, a process ultimately akin to a call and response between musicians. The show is only a temporary celebration of his focal project, a publication of the paired works through Pochino Press, also available for purchase at Oakstop. Runs through August 29. 510-698-9370 or Oakstop.com.